Fishing the reefs off Palm Beach County offer anglers of all skill levels the opportunity to hook into large game fish such as Sailfish, Cobia, Mahi Mahi, Wahoo and Tuna but what is seldom seen are the beautiful and unusual reef fish. There are over 250 species of fish inhabiting the reefs along Florida’s coast. Some are too small to catch on hook and line such as Gobies and Blennies but others do manage to come up to astonish anglers fishing bottom rigs aboard the Lady K. All reef fish are safely and carefully dehooked, vented and released back to the reef – they are the true jewels of the reef. This beautiful Spanish Hog-fish is a member of the Wrasse family. They feed on small shrimp, marine worms, crustaceans and other small invertebrates. 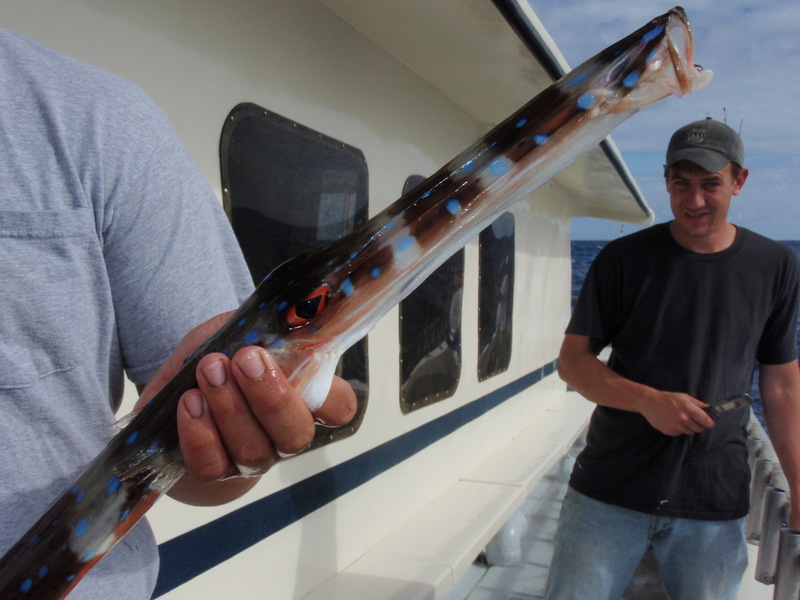 During this time of year, anglers fishing with cut squid on bottom rigs or small jigs in search of Yellow-tail Snapper or Porgies may, in fact, hook one of these stunning reef fish. The color pattern of the Trumpet fish makes this long, slender predator a master at camouflage. They commonly hang vertical in the water alongside sea fans, sponges and coral where they ambush small fish and shrimp. 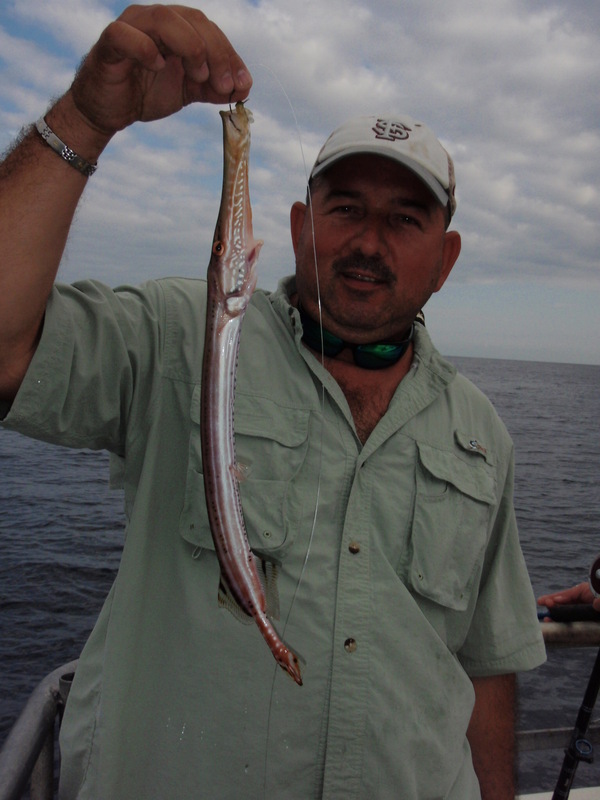 Trumpet fish are a very rare catch aboard the Lady K for they have very small mouths and prefer live food over cut bait. Another unusual reef fish is the Blue-spotted Coronet. These fish sport neon, electric blue spots and stripes along with a banded pattern which helps them to blend in with the reef as they glide horizontally just above the reef. 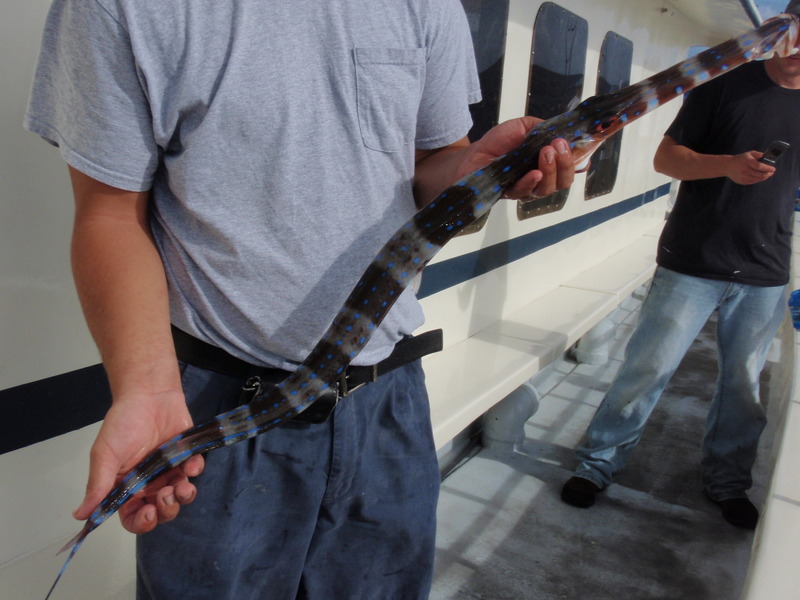 These reef predators can be caught by anglers fishing with sardines as well as squid and can reach a length of three and a half feet long. 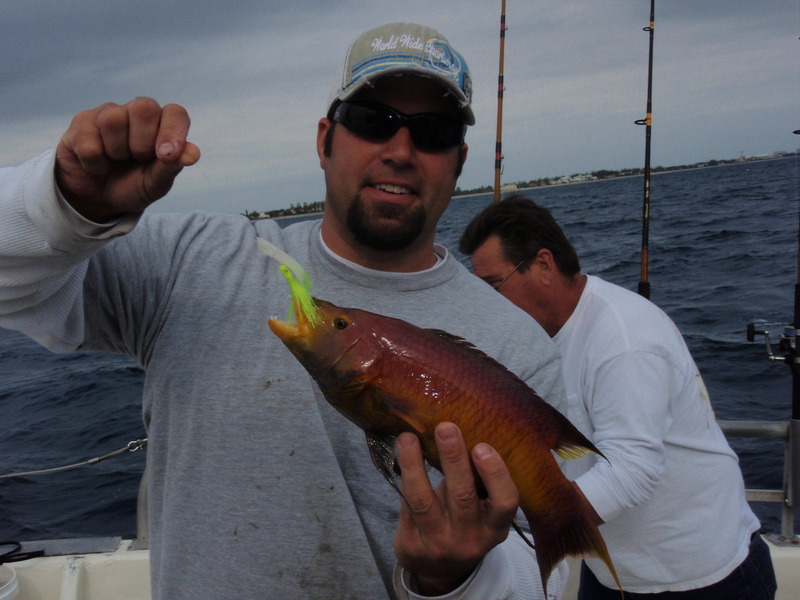 Bottom fishing not only offers anglers the chance at bringing home good table fare, but also the opportunity to catch and release many different, colorful reef fish making this type of fishing perfect for children or out-of-state visitors just wanting to have a fun day on the water. Remember to bring a camera so you may capture the photos of these jewels of the reef, sure to make memories of a lifetime with family and friends. Your adventure awaits you aboard the Lady K.